The goofy way we gardened this year was quite the joke on our street. Okay, so first let me straighten this statement out. When we planned our garden we knew we'd have vegetables and possibly some flowers. I bought several packets of seeds. This was the plan: start our seeds indoors and transplant them outside once the frost has passed. I started some chives, thyme, oregano, pimento peppers and poppies. While I was out with some friends more seeds were started. I came home to several seeds except that not a one of them was labeled. As far as I could tell we had some squash and then flowers and peppers? The mess of seed packets and potting soil was a sight and the memory of an overwhelmed Papa was not much help. Even the kids didn't remember what was what. I grouped what I could together: squash and flowers/peppers. Those seeds became the basis of the F'Laker Mystery Garden. Insert laughing here. Yes. We had about 50 unlabeled plants. As a result we ended up planting what we thought were bell peppers next to the tomatoes. Except that they were not bell peppers but sunflowers. I might add that when we planted them they were small and pepper-like. 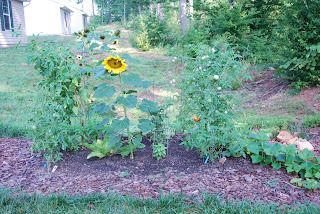 It was only after returning from our vacation that it was clear sunflowers were planted. Now do you see the joke? Here we had all these tomatoes and "peppers" only to discover that the mystery plants were not what we planned to place in the vegetable garden. Mystery solved. It's not such a bad thing. The sunflowers have been a nice addition bringing in the bees and making the garden cheerful. I just had other plans for the sunflowers but that can wait for next year. But the best part has yet to come. When I got my first issue of Organic Gardening magazine I was very excited this was just the thing I needed to get more ideas for our garden. There in the News section was a small article about bees and caterpillars. We all know that bees are the pollinating super stars of gardens but they are also excellent watchdogs. It turns out that the buzzing bees deter all those leaf munching caterpillars. Since caterpillars are a tasty dinner for hunting wasps they get very frightened when they sense the air vibration of a buzzing insect. They are unable to tell the difference between a bee and wasp so they run for cover when they detect buzzing. So.....our sunflowers were an excellent mistake! They have helped keep those hungry caterpillars from chomping up our peppers and tomatoes. Yay for our Mystery Garden! The magazine recommends planting sunflowers, cosmos, borage, cilantro and zinnias with your vegetables. As I began to read more about this I noticed that Companion planting seems to be the way to go when organically gardening. And you know what? It's perfect for me and my eclectic ways. I like the idea of having a variety of plants in one plot it makes for an interesting and surprising garden. I began to search for more companion pairs because it's just not caterpillars that become a problem in the garden. For us we can't seem to get melons or squash to grow successfully. If it's not the stink bugs then it's the vine borers. The article on Marigolds Protect Melons is very inspiring. Our melons became quite a feast for those stupid vine borers and slugs. Next year I am determined to get a pumpkin grown for Halloween. I'm looking for more companion plants (radishes are one) and of course will need some sort of pesticide to treat them BEFORE the destroyers get started. Another location might be in order. I don't like the idea of having all the problems centralized. Looking ahead to next season the squash will need a good sunny and dry place to grow. I wonder if much success has been had with getting them to grow up a trellis? It seems that with a lot of effort a trellis is an option. I guess I'll need to think some more about the squash growing.